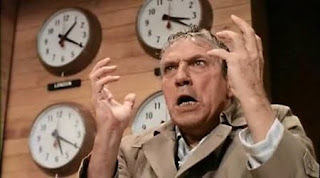 ... that's how long it's been since principal photography wrapped. What have we done since then? Sure feels like a lot. First, I immediately took two weeks off to sleep, spend time with my daughter and basically process the production. At the end of January I met with Matt Rhodes, our special effects master, to go over the scenes that needed effects. By mid-February THE MACHINE had finally had arrived. THE MACHINE is my new editing station, a shiny brand new iMac7. New software was immediately loaded: Final Cut Studio, MS Office, QuickBooks and Final Draft. It's a little daunting just thinking about editing; I have a massively huge learning mountain to climb. My first goal: to cut the trailer. I also have a pile of DV productions that are sitting there waiting for me to create them. Let's just say there are a lot of "opportunities" to work. AD Wyatt Norton, my friendly supporter and wise AD, was excited to shoot a scene for the credits that got cut from the shoot. He said, "That dialogue is too good to waste," which is a great compliment in its own way but also a challenge. It sounded good to me, but I was having a hard time conceptualizing where it would fit in. Should we put it at the end? But then, would it take place after the bridal store visit, or would we have to put it in the front, so it would be an event before the the movie scenes happened? I called Mick, my trusty co-writer, and he was having the same struggle. Then I called AD and opened up the conversation -- what are we trying to do with it? Since I had to do a little re-write of the scene -- taking it out of the bridal store and moving it to a separate location -- I had to know the "why" behind the scene. AD got deflated that we had to take his little idea of whimsy and catapult it into practical reality... but I think we came up with a fair solution. I wrote the scene so that it could sit anywhere in the film, front or back, and take place in any time, past or future. We'll put it in and see where it works. THE SCENE: Holly and Jennifer showed up. We put them in clothes and makeup, and set the lighting. While we had originally conceived it to take place on a beach, AD hadn't had time to set up with studio to do a wide shot so we had to stay with medium and close-up shots. Hmnmm.... already it's different. As we were prepping the bottle of champagne for the toast, the cork popped, and I was okay because I had brought a couple of bottles. I pulled Adele, our trusty mannequin into the shot and laid out all the liquor bottles on the bar. I brought two margarita glasses from my favorite SF Mexican Restaurant, La Barca, and pink champagne. Where are they? On a beach somewhere, at a resort, at the tiki bar, looking tan, wearing summer clothes, and toasting champagne to Helen's "happily ever after." It was a struggle. We had no help (Olivia, our trusty studio assistant had stayed home that day to do a history project), and AD had had a rough couple of weeks. By the time Jen had left, AD realized that we had forgotten to back-light Jen's close-up, and it was the first time I actually had to say, "We'll fix it in post. " By 1 pm, AD and I were finishing up the last of the champagne and coming up with ideas on how to use the set, listening to Kasey Chambers sing, "If I Were You (It's All Gonna Be Okay)." Nice. No matter what, at least we all got to drink a little champagne in the city in the AM on a Sunday. I've spent a lot of the post-shooting time reading background on editing, filmaking, writing, working with studios, etc. 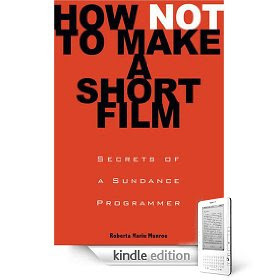 One book I did read before starting production was "How NOT to Make a Short Film," by Roberta Munroe, a filmmaker and longtime Sundance Short Film Program Manager. Most of the dangerous situations I had steered clear of, but two things stood out to me: (1) Don't have your DP do your budget, and (2) Do not produce and direct it yourself. Let me just say that I did break these two cardinal rules. The first, well, I did need his input, so he gave me a budget, which I immediately cut by one-third. This did not make my DP very happy, but in the end I think we came up with a fair compromise and got a decent crew. The second is an unavoidable factor to being a first-time filmmaker. Who is going to believe in your film as much as you do, and how else are you going to come up with the money if you don't approach family and friends? The challenge with the "two-hat phenomenon" is that yes, this absolutely does affect your filmmaking. I did not have the time to create a shooting script and an ideal shot list. I did not have the time to work with the actors as much as I should have, nor plan the hair and makeup as I would have liked (no, I did not want my lead mother to have a granny bun, but she did anyway.) I did not have the time to plan the pick-up shots in the studio and help AD create the set. And more importantly, throughout the film and continuing afterwards, I must do what my producer could have been doing: accounting, writing checks, following up with crew, cast and site contacts. Since the arrival of my new beloved MACHINE, I have been inputting bank statements and categorizing funds spent. What does this mean? Well, it means this film kind of shows who I am as a filmmaker. Bottom line, it doesn't truly reflect my plan of how these scenes should have played out. And while I know the film will be good, really good, at the same time, what I saw in my mind is absolutely not what we shot. I'm not saying that's good or bad, and maybe it's something that always happens, but it sure isn't a direct reflection of my vision. I'm not sure if there's any way around this as a first-time filmmaker. I don't think there is. So give yourself plenty of time in pre-production, and by PLENTY I mean at least one year or more, ideally 18 months. There's my wisdom for the day. Eat it with some ice cream. Our pick-up shots were put on hold until later in February, when all the plumbing work will be done in the studio. No good when there's clanging and banging in the background. Until then I'm prepping all the background work. Met with my post-production whiz Matt, sent him and editor Scott the shooting notes (this is a story in itself, just getting them scanned, but I'll spare you the technical drama). Bought a new editing system with my annual bonus, got the Final Cut Studio upgrade, pulled out my box of CDs (from unknown bands so they'll be "nicer" to license) and now reading, researching, listening and watching for ideas. 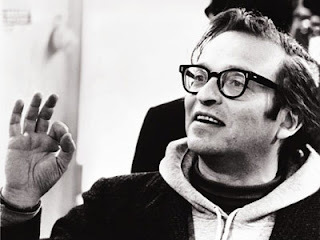 I feel like a dork reading Sidney Lumet's book "Making Movies" but it's a good read. Interesting, factual, HONEST. He's having fun and making solid movies -- Serpico, Dog Day Afternoon, Network, 12 Angry Men, The Verdict, Long Day's Journey Into Night, Murder on the Orient Express. I like his films but their look is a little gritty for me. At the same time, he thinks a lot about look, perspective, camera angle, color density, all of it. I like to believe that I think like that too, but maybe in a prettier kind of way. He's quite literal in his interpretation of the material, probably due to his theater background, and reading his approach makes me appreciate the art of filmmaking more deeply than before. Went to see Jim Jarrett in his one-man play, "Meisner," about the great acting coach Sanford Meisner. The play was well-done although I have to say that I felt like I was getting lectured the whole time... but I guess that's who Sanford was. A real teacher. Jim sent me a personal invitation so I took myself and my friend Kris and enjoyed it immensely. 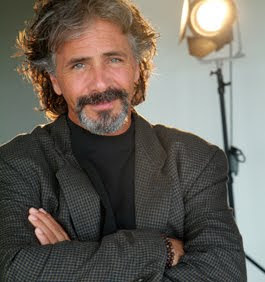 For those of you new to this blog, Jim Jarrett was my first choice to play the only male character in this film, and I emailed him (and his assistant) several times over the past few months to see if we could make it work. He's a busy man but he would have been perfect. I was greatly disappointed that we couldn't make it happen. I think if I had called we might been more connected about it, but I was juggling just too many balls at that point. He's a talented guy busy with his school, and Maria was wearing too many hats. Since I'm doing all this research, my Netflix list is expanding exponentially. I hope it rains more so I can watch them all this month. I feel like I'm everywhere & nowhere at the same time... and oh yes, that's the title of a Two Sticks song. And thus, my tentacles are out. I'm out there feeling, touching, experiencing, so I can go into post-production with a lot more than what's currently in my little suitcase of tricks. I know just enough about editing to make me dangerous, so I've brought two more experienced people onto my team -- Matt Rhodes and Scott Daigle. My co-writer is also a creative editor, which means we will have a lot of little fingers helping out. I'll be noodling with the backup and working on a trailer. That should re-acquaint me with the footage and give me more details so I can be a better director while we're editing.